You will find Shaun out on the road pounding the pavement whenever the weather allows. Shaun is an avid runner who started running marathons five years ago. Since that time, he has run in 14 marathons including the Boston Marathon (four times) and the New York marathon. He also has done seven triathlons. He started teaching swimming lessons in 1975 at the Rochester YMCA and teaches lifeguard training and water safety. 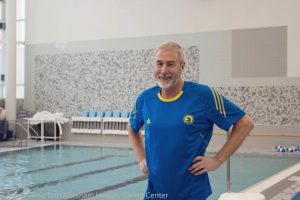 Shaun joined the Dan Abraham Healthy Living Center six years ago and passes on his swimming knowledge to our members here. Join Shaun in swimming lessons and catch the fire that motivates him!